Riot Act is the seventh studio album by American alternative rock band Pearl Jam, released November 12, 2002 through Epic Records. Following a full-scale tour in support of its previous album, Binaural (2000), Pearl Jam took a year-long break. The band then reconvened in the beginning of 2002 and commenced work on a new album. The music on the record featured a diverse sound, including songs influenced by folk, art rock, and experimental rock. The lyrics deal with mortality and existencialism, with much influence from both the political climate after the September 11, 2001 terrorist attacks and the accidental death of nine fans during Pearl Jam's performance at the 2000 Roskilde Festival. 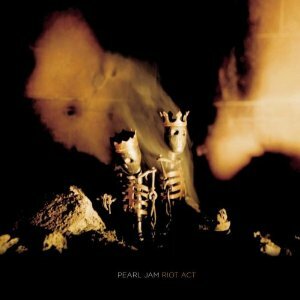 This page has a link to videos and lyrics for every song on the Pearl Jam album Riot Act. Please enjoy and share. My favorite is 'Ghost'. I just love the power of it. Play it loud! Second is 'All or None'.